Any chance at changing the materials needed for the Gardening apron or making them drop from Box of garden supplies? been playing a game with loot respawn set on and been foraging for days and still dont have the mats. Its a big gated item you need to get into the better items the mod has. What would be the best way to go about editing the Trading Post items for a dedicated server? Can I just change a file or do I need to make a patch and upload it to Steam? and search for 'Track' to find the other animals and their requirements. So far the highest requirement is level 5 trapping. I only use the donkeys for their ability to carry bags. Add 2 Fine Leather Alice packs to a donkey for 91 storage (if you have the organized trait) and 100% weightreduction . They can be used in primary and/or secondary slots. I've also noticed some errors and misspellings, is there somewhere specific I should put them? 1526858660898 ERROR: can't find recipe source "Soap" in recipe "Clean Empty Metal Barrel"
1526858660898 ERROR: can't find recipe source "Soap" in recipe "Clean Empty Blue Barrel"
1526858660900 ERROR: can't find recipe source "Soap" in recipe "Clean Bottle"
1526858660901 ERROR: can't find recipe source "Soap" in recipe "Clean Empty Glass Bottle"
1526858660902 ERROR: can't find recipe source "Soap" in recipe "Add Sink"
1526858660902 ERROR: can't find recipe source "HCCatfoodOpen" in recipe "Feed Cat"
1526858660903 ERROR: can't find recipe source "HCCatwhitemale" in recipe "Feed Cat"
1526858660906 ERROR: can't find recipe source "Soap" in recipe "Clean Platine"
1526858660907 ERROR: can't find recipe result "HCFinewoodfloor    	Sound" in recipe "Make Finewood Floor"
1526858660909 ERROR: can't find recipe source "HCYarnorange" in recipe "Make Carpet"
1526858660910 ERROR: can't find recipe source "Coffee" in recipe "Make Monkey Tail Pot"
1526858660914 ERROR: can't find recipe source "Destroy HCChristmashamcasserole" in recipe "Empty Christmas Ham"
1526858660917 ERROR: can't find recipe source "HCWheat" in recipe "Plant Crop"
1526858660920 ERROR: can't find recipe source "HCPottedWheat" in recipe "Remove Crop"
1526858660921 ERROR: can't find recipe source "HCPottedWheatdry" in recipe "Remove Crop"
1526858660922 ERROR: can't find recipe source "HCPottedWheatsmall" in recipe "Remove Crop"
1526858660922 ERROR: can't find recipe source "HCPottedWheatsmalldry" in recipe "Remove Crop"
1526858660923 ERROR: can't find recipe source "HCPottedWheatdead" in recipe "Remove Crop"
1526858660926 ERROR: can't find recipe source "Soap" in recipe "Clean Glass Bong"
1526858660926 ERROR: can't find recipe source "Soap" in recipe "Clean Acrylic Bong"
1526858660928 ERROR: can't find recipe source "HCPlasticforkbox" in recipe "Unbox Plastic Forks"
1526858660929 ERROR: can't find recipe source "HCPlasticknifebox" in recipe "Unbox Plastic Knives"
1526858660929 ERROR: can't find recipe result "HCPlasticknife" in recipe "Unbox Plastic Knives"
1526858660932 ERROR: can't find recipe result "HCCatfoodOpen" in recipe "Open Cat Food"
1526858660932 ERROR: can't find recipe source "Soap" in recipe "Clean Empty Ammonia Can"
1526858660933 ERROR: can't find recipe source "Soap" in recipe "Clean Empty Liquid Soap Can"
1526858660934 ERROR: can't find recipe source "Soap" in recipe "Clean Empty Liquid Soap Can"
1526858660935 ERROR: can't find recipe source "Soap" in recipe "Clean Empty Insecticide Can"
1526858660943 ERROR: can't find recipe source "Soap" in recipe "Clean Empty Liquid Soap Can"
1526858660947 ERROR: can't find recipe source "Soap" in recipe "Make Soap Shards"
1526858660948 ERROR: can't find recipe source "HCTOngswood" in recipe "Make Bronze Spiked Mace"
You may want the advanced trading post by Nolan. I really like smithing and forging my own weapons, but currently weapon smithing is not really rewarding in my opinion. The melee weapons you can forge in HC are equal to the existing weapons, so the point of weapon smithing is only to have a renewable source of weapons. However, if you use Axes as primary weapon, you don't need a renewable source, because you can craft 3 Makeshift Axes out of one Axe, and (with increased Sharp Maintenance) by the time your Blunt Makeshift Axe is broken for good, you usually already found a new Axe in a zombie corpse. Additionally, you can craft normal Axes (Make Steel Axe) instead of a Steel Battleaxe. The normal Axe can be recrafted into Makeshift Axes and then recycled, the Steel Battleaxe can only be recycled, so normal Axes are superior to Battleaxes. How might I delete the trading post from Hydrocraft? I've tried cheat menu with infinite carry weight, but I still can't pick it up for some reason. I've given the HC weapon smithing system some thought, and I think the current system is a bit pointless. As a player, you invest a lot of effort into mining, creating a blacksmith apron / fire suit, building a smelter, blast furnace and anvil, leveling up Metalworking, Blunt and Sharp Maintenance and crafting your smithy hammers. And then the best weapons you can forge are kinda a downgrade of your Axe/Makeshift Axe/Worn Makeshift Axe/Blunt Makeshift Axe (if these were your primary weapons before). If you like close combat kill moves (jaw stab), the Great Sword is better than knives - that's okay. 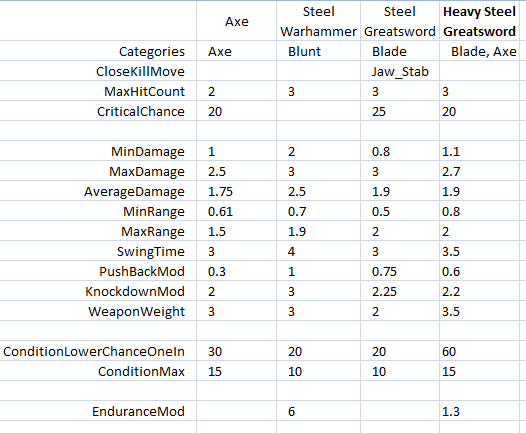 Warhammer: Warhammer stats equal Sledgehammer stats, but I don't know how many players actually use them, because of the high EnduranceMod (6). Warhammer has 3 weight instead of 6, so that's a plus, but the durability is lower. I guess that's okay. I think most players use Axes as primary weapons. Battleaxe stats equal Axe stats, but the durability is lower. Now let's think about durability: Axes wear down because the handle is made of wood. That's why you repair them with wood glue. The Axe Head has much higher durability, because it is made of steel. That's why the Makeshift Axe system is realistic: You remove the axe head, craft a new handle and make a new axe, until the axe head is so blunt that you can't use it anymore. Now the Crowbar: 70*15 = 1050 total uses, and you can't repair it. I think it's more realistic to not give the option of repairing it. Likewise, it's unrealistic to repair a Steel Sword by putting a Steel Ingot on top of it. Steel Battleaxe: 20*15 = 300 | 300*1.5 = 450 total uses. And you can't recraft it into Makeshift Battleaxes. You can recycle the steel, but you can also recycle the steel of a broken Blunt Makeshift Axe. So objectively, normal Axes are better than Steel Battleaxes. The current Steel Great Sword is made for stabbing and cutting zeds, so it is still a light sword that uses its sharpness and thinness. That's why it has such a low durability, and that's realistic, because thin swords wear down extremely fast. Now if I was a blacksmith in the zombie apocalypse, I would craft a much thicker sword that doesn't rely on sharpness, but rather on blunt-sharp impact, like an axe does. A heavy sword that smash-slashes through zeds. It does not have to be sharp because it does not have to cut through armor (like a warrior/samurai would have to). Instead there are squishy zeds, who are rather soft, because they are standing in the rain so their flesh gets squishy. And after most humans were turned into zeds, the zeds actually have nothing to eat, so their body becomes even softer. Such a thick sword would have much higher durability. And it's also an axe! Which gives the sword the vanilla axe bonuses: Faster axe swing for the Axe Man profession, and damage bonus against standing targets. I think it is still balanced, albeit a considerable upgrade of vanilla axes. And it would be an appropriate reward for all the effort a player has to spend to forge it. I think most players use Axes as primary weapons. I personally prefer the Machete. What about PVP melee where the characters are wearing armor? On a side note it would be cool if we could get zeds to actually equip armor to make them harder to kill. Actually my view is that since you are doing it by hand it is a lesser quality than the industrial factory made axes from before the apocalypse. Which is my most weapons are a lower durability. Good point. Well, durability loss unfortunately is not dependent on impact object hardness. I have no idea how to solve that problem. I guess it's better if I make an Add-On Mod with that weapon instead... Would that be okay with you? I already thought about that before posting my suggestion, but I agree. However, self-made massive steel should still be more durable than wood. Vanilla Axe Head (steel) was 2025 total condition, vanilla Crowbar (iron) 1050 --- so, what about 700 total condition instead of 900 for the new sword? Bug Report: Recipe "Fill Cheese Vat"
When you craft it while the Wooden Buckets with Milk are on the ground, they are not removed, and you still get 4 additional Wooden Buckets. This is true for any drainable item. Do not put them on the floor when crafting. Always pick up drainable items. but I tried it two times, and they always stayed and were not removed. Question: If you remove the 'destroy' from the recipe, wouldn't it then work how it's supposed to? Im sure this has been asked before but how do you move, remove, or destroy anchored stations like the furnace or herbalist table? I cant seem to find any info about it. With build 39 out please report any bugs. I would like to get a patch out soon, but I don't know what needs to be fixed yet. Also I do not think i can fix any lag. 1527862367775 ERROR: can't find recipe result "HCCatwhitemale" in recipe "Feed Cat"
1527788717300 ERROR: can't find recipe source "SheetPaper" in recipe "Make Shotgun Shells"
1527788717310 ERROR: can't find recipe source "SheetPaper" in recipe "Fill Bee Smoker with Fuel"
1527788717310 ERROR: can't find recipe source "Soap" in recipe "Clean Empty Metal Barrel"
1527788717310 ERROR: can't find recipe source "Soap" in recipe "Clean Empty Blue Barrel"
1527788717310 ERROR: can't find recipe source "SheetPaper" in recipe "Make Potato Cannon Blueprint"
1527788717310 ERROR: can't find recipe source "SheetPaper" in recipe "Make Flamethrower Blueprint"
1527788717310 ERROR: can't find recipe source "SheetPaper" in recipe "Make Rocket Launcher Blueprint"
1527788717310 ERROR: can't find recipe source "SheetPaper" in recipe "Make Duct Tape Fletching Blueprint"
1527788717310 ERROR: can't find recipe source "SheetPaper" in recipe "Make Bone Arrowhead Blueprint"
1527788717310 ERROR: can't find recipe source "SheetPaper" in recipe "Make Fishing Rod Blueprint"
1527788717310 ERROR: can't find recipe source "SheetPaper" in recipe "Make Fishing Net Blueprint"
1527788717310 ERROR: can't find recipe source "SheetPaper" in recipe "Make Crate Trap Blueprint"
1527788717310 ERROR: can't find recipe source "SheetPaper" in recipe "Make Stick Trap Blueprint"
1527788717310 ERROR: can't find recipe source "SheetPaper" in recipe "Make Snare Trap Blueprint"
1527788717310 ERROR: can't find recipe source "SheetPaper" in recipe "Make Trap Box Blueprint"
1527788717310 ERROR: can't find recipe source "SheetPaper" in recipe "Make Cage Trap Blueprint"
1527788717310 ERROR: can't find recipe source "SheetPaper" in recipe "Make Mousetrap Blueprint"
1527788717310 ERROR: can't find recipe source "SheetPaper" in recipe "Make Nail Trap Blueprint"
1527788717310 ERROR: can't find recipe source "SheetPaper" in recipe "Make Hazmat Suit Blueprint"
1527788717310 ERROR: can't find recipe source "SheetPaper" in recipe "Research Professional Lab"
1527788717310 ERROR: can't find recipe source "SheetPaper" in recipe "Research Battery Array"
1527788717310 ERROR: can't find recipe source "SheetPaper" in recipe "Make Taxadermy Jackalope Blueprint"
1527788717310 ERROR: can't find recipe source "SheetPaper" in recipe "Make Steam Pressure Pot Blueprint"
1527788717310 ERROR: can't find recipe source "SheetPaper" in recipe "Make Spirulina Composter Blueprint"
1527788717310 ERROR: can't find recipe source "SheetPaper" in recipe "Make Computer Mouse Blueprint"
1527788717310 ERROR: can't find recipe source "SheetPaper" in recipe "Make Computer Keyboard Blueprint"
1527788717310 ERROR: can't find recipe source "SheetPaper" in recipe "Make Computer Monitor Blueprint"
1527788717310 ERROR: can't find recipe source "SheetPaper" in recipe "Make Extract Working CPU Blueprint"
1527788717310 ERROR: can't find recipe source "SheetPaper" in recipe "Make Computer Tower Blueprint"
1527788717310 ERROR: can't find recipe source "SheetPaper" in recipe "Make Computer PSU Blueprint"
1527788717310 ERROR: can't find recipe source "SheetPaper" in recipe "Make Computer Fan Blueprint"
1527788717320 ERROR: can't find recipe source "Soap" in recipe "Clean Bottle"
1527788717320 ERROR: can't find recipe source "Soap" in recipe "Clean Empty Glass Bottle"
1527788717320 ERROR: can't find recipe source "Soap" in recipe "Add Sink"
1527788717320 ERROR: can't find recipe source "SheetPaper" in recipe "Build Archery Target"
1527788717320 ERROR: can't find recipe source "SheetPaper" in recipe "Make Folding Sign"
1527788717320 ERROR: can't find recipe source "HCCatfoodOpen" in recipe "Feed Cat"
1527788717320 ERROR: can't find recipe source "HCCatwhitemale" in recipe "Feed Cat"
1527788717320 ERROR: can't find recipe source "SheetPaper" in recipe "Write Suicide Note"
1527788717320 ERROR: can't find recipe source "SheetPaper" in recipe "Box Resistors"
1527788717320 ERROR: can't find recipe source "SheetPaper" in recipe "Make Circuit Print"
1527788717320 ERROR: can't find recipe source "Soap" in recipe "Clean Platine"
1527788717320 ERROR: can't find recipe source "SheetPaper" in recipe "Make Charcoal"
1527788717330 ERROR: can't find recipe result "HCFinewoodfloor Sound" in recipe "Make Finewood Floor"
1527788717330 ERROR: can't find recipe source "HCYarnorange" in recipe "Make Carpet"
1527788717330 ERROR: can't find recipe source "Coffee" in recipe "Make Monkey Tail Pot"
1527788717330 ERROR: can't find recipe source "Destroy HCChristmashamcasserole" in recipe "Empty Christmas Ham"
1527788717340 ERROR: can't find recipe source "HCWheat" in recipe "Plant Crop"
1527788717340 ERROR: can't find recipe source "HCPottedWheat" in recipe "Remove Crop"
1527788717340 ERROR: can't find recipe source "HCPottedWheatdry" in recipe "Remove Crop"
1527788717340 ERROR: can't find recipe source "HCPottedWheatsmall" in recipe "Remove Crop"
1527788717340 ERROR: can't find recipe source "HCPottedWheatsmalldry" in recipe "Remove Crop"
1527788717340 ERROR: can't find recipe source "HCPottedWheatdead" in recipe "Remove Crop"
1527788717340 ERROR: can't find recipe result "Teabag" in recipe "Make Teabag"
1527788717340 ERROR: can't find recipe source "Soap" in recipe "Clean Glass Bong"
1527788717340 ERROR: can't find recipe source "Soap" in recipe "Clean Acrylic Bong"
1527788717350 ERROR: can't find recipe source "HCPlasticforkbox" in recipe "Unbox Plastic Forks"
1527788717350 ERROR: can't find recipe source "HCPlasticknifebox" in recipe "Unbox Plastic Knives"
1527788717350 ERROR: can't find recipe result "HCPlasticknife" in recipe "Unbox Plastic Knives"
1527788717350 ERROR: can't find recipe source "SheetPaper" in recipe "Make Label"
1527788717350 ERROR: can't find recipe source "SheetPaper" in recipe "Make Lamp Shade"
1527788717350 ERROR: can't find recipe source "SheetPaper" in recipe "Make Anti-Depression Pills"
1527788717350 ERROR: can't find recipe source "SheetPaper" in recipe "Make Beta Blocker Pills"
1527788717350 ERROR: can't find recipe source "SheetPaper" in recipe "Write Music"
1527788717350 ERROR: can't find recipe source "SheetPaper" in recipe "Fold Paper"
1527788717350 ERROR: can't find recipe result "SheetPaper" in recipe "Remove Paper Screen"
1527788717350 ERROR: can't find recipe result "HCCatfoodOpen" in recipe "Open Cat Food"
1527788717350 ERROR: can't find recipe source "Soap" in recipe "Clean Empty Ammonia Can"
1527788717350 ERROR: can't find recipe source "Soap" in recipe "Clean Empty Liquid Soap Can"
1527788717350 ERROR: can't find recipe source "Soap" in recipe "Clean Empty Insecticide Can"
1527788717370 ERROR: can't find recipe source "Soap" in recipe "Clean Empty Liquid Soap Can"
1527788717370 ERROR: can't find recipe source "SheetPaper" in recipe "Make Dynamite"
1527788717370 ERROR: can't find recipe source "Soap" in recipe "Make Soap Shards"
1527788717370 ERROR: can't find recipe source "HCTOngswood" in recipe "Make Bronze Spiked Mace"
Hydrocraft v10.2 has been released! - Can carve wooden spatula, spoon and fork. - New art from purple hat. - Jagermister now called "Herbal Liqour". Note that this was made for build 38. I have done nothing special for build 39 with this so i you are still using the build 38 branch it should still work. Just wanted to get all the stuff i had been working on before the update out before making any build 39 changes. Do you think this will be able to be fixed in the next Hydrocraft update? Maybe keep HCFunnel, replace on keep HCFunnel/HCGlassfunnel,?